How would you feel if you received an old Corriere della Sera with your bottle of EV Olive Oil? We are obsessed with recycling and those who aren’t should be. – we’ll make you fluent in Italian. Previous Post Not your ordinary accountant! Giacomo is your business partner. He also likes Gustiamo’s foods! Next Post Welcome Twenty Ten! Gustiblog takes a break. Read about us on Gustiamo.com, Facebook and Twitter! I assume you are looking for responses. The problem with using newspapers as filling is that the filling will likely become garbage, unlike so much of today’s newspaper that is being recycled. Obviously the thinking at Gustiamo is progressive, so perhaps you might examine other possible materials that could be used for stuffing. For example, in our own company we have many small pieces of fabric that might be used, assuming it would not create other issues on your end (fabrics would be indiscriminately bagged, mixed fiber content, weight, color, size of pieces. Currently this fabric is pure waste, so at least it would serve to help Gustiamo in its effort to reduce costs and create less waste. If you are interested, I will speak to some of our managers and let you know. Another possibility you may have studied already is it to recycle the packaging used in your incoming product. Again an example – it is quite inexpensive to cut corrugated boxes down to sizes that can be bent by hand and used as filling. Thank you for your thoughts, Steven. Great ideas! We will discuss them in the New Year and will definitely get back to you with any questions. Happy 2010! Here’s to a new decade! My sister and I are always using old papers when we send our parcels over the ocean to each other. I have never known another way. I don’t know what she is doing with our papers, but we are actually reading the local news from the german village she is still living in. My (american) husband takes an extra effort to flatten the paper balls, then reads the words to me (without really knowing what he is reading), while I am cooking. I wished we cook do that more often. But as you know, with the crumbling value of the Dollar and the german postage rates, this is a rare joy. If I would get paperballs of italian old papers in my next order from you, I would not mind it at all. Maybe I would also have a look at the flattened pages, although my italian is really only marginal. yes!!! 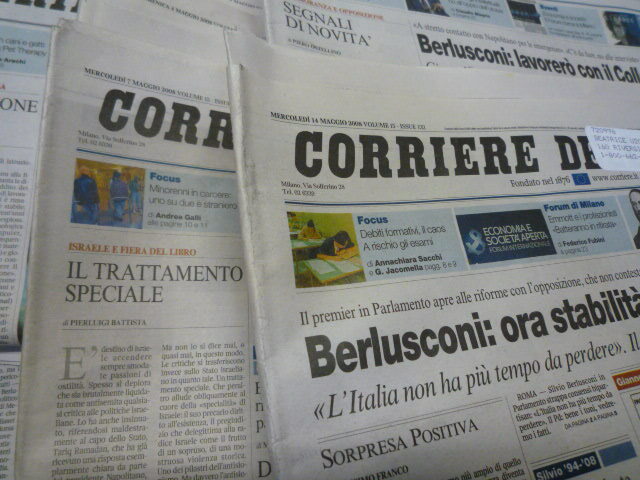 i would love it if my espresso coffee arrived in corriere della sera!! !